Eliza Ellie’s fitness campaign attempt two…. My last year’s plan to get bike fit has gone somewhat skewed due to injuries, but this year I am determined to make it work. And if I can make it work – so can you! And yes, I am pointing to make it more dramatic! Over the next few months and until the end of July I will be putting up rides to not only get us started but also to improve our fitness, discover great routes and maybe even get you to enter an event!? 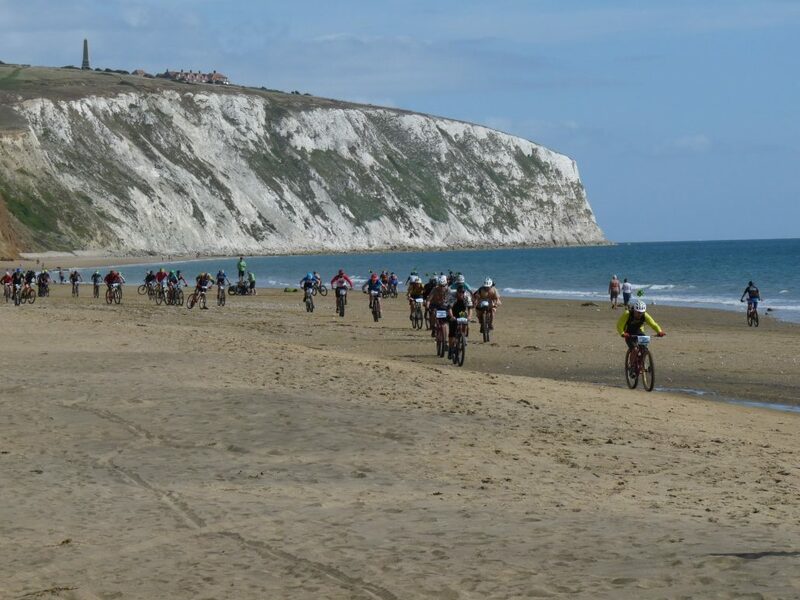 Perhaps you have already signed up for some awesome event like the SDW or looking to participate in this year’s Beachy Head Sportive? No? 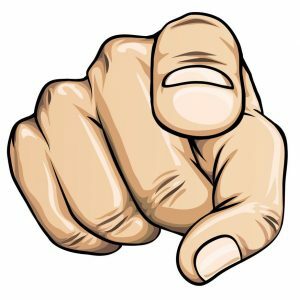 – Sign up and start training! The kick-off will be on the Easter Monday (TOMORROW!) and then one or two rides a week. Keep an eye on the calendar and Facebook. All rides will be off-road. I intend to start rides at a slower pace and shorter distance to break into this fitness malarkey slowly, and build up both the speed and mileage as we get fitter with each ride. We will cover our local SDW tracks and parts of the MTB sportive. I may even throw in a homing pigeon ride for extended fun. Watch this space! It’s a posh way of saying that a group of cyclists get together for an organised ride. It’s a non-competitive event and you ride against yourself. This was my first big event in the MTB cycling world. After a recent accident and ongoing health problems this was going to be a challenge. Matt Baker had offered to drive us to the start line and we set off at 6 AM; it was his birthday and he never even mentioned it! A great example of the kind of people that make up the Cycle Seahaven family, without who I could never have completed this challenge. The day started out early and chilly, with an autumnal feel in the air! We layered up and set off on our adventure for the day. Knowing the bad weather was going to hit us by lunchtime we pushed hard to cover as much ground as we possibly could before the rain. The route was well mapped out and marshalled and the stops were just right for me, although I only stopped twice because by the third stop I felt I couldn’t allow my body to cool down or I’d struggle to restart. The other riders were friendly and supportive with lots of banter so it felt like one big team effort. There was a mix of different riders, from people who obviously just turned up to give it a go and others who had been training for months. Regardless, everyone was there and giving it their best and that was fantastic to be a part of. Once underway I was surprised by the amount of people that had broken down! Checking your bike before an event like this is essential. Thankfully I managed the whole ride without any mechanicals, it definitely pays off to take care of your bike. One of the difficult things for me was getting stuck behind people on hills, especially when I needed the momentum to get up but at least I managed to resist shouting “pedal, pedal, pedal!” at them. The rain hit just before lunch and that’s when the chaos began. The mud slides and chalk paths were like nothing I have ever seen before, but we all enjoyed the slip slide and slosh. Obviously, Marmaduke (my faithful Marin mountain bike) is a mud magnet so I found it hard to stop him ploughing through the muddy, boggy puddles and plastering my fellow riders. Sorry guys. My best part of the day was towards the finish when we approached Truleigh Hill. From the very bottom people were pushing their bikes up the slippery chalky climb. I was determined to ride to the top and so dug deep. I had a nasty slip on my way up and fell off but pushed through and got back on. The cheers from those pushing help me make it to the top. When I finally reached the top, the relief kicked in as a new it was pretty much over! However, I have underestimated the downhill descent from Truleigh that was 2 miles of deep mud. Loads of people were crashing and it was carnage particularly as a soft landing involved getting splattered in mud. A very enjoyable slide to the road! Then we whizzed down to the seafront head on to the wind, this is when I realised how frozen I was. 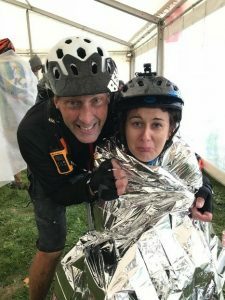 We pushed on with everything we had to get to the finish line where I could have quite happily found a quiet corner to collapse in. Thank you to Ellie for the foil blanket and 1/2 a cup of tea (the rest shaken out of the cup… brrr). I have never been so wet and cold in my life but can’t wait to do it again next year, a wonderful community of people and for such a great cause. Thank you so much for those of you that have supported me leading up to the ride and a million kudos for Guy, Paul and Jim for staying by my side and getting me to the finish. It is a Marmite Thing – SS UK 2018. 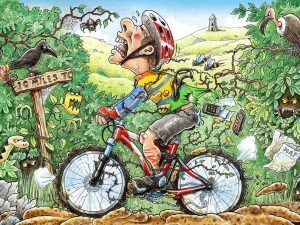 Riding without gears isn’t everyone’s cup of tea. Some do it for fitness, others for ease of maintenance and a few are just plain bonkers. 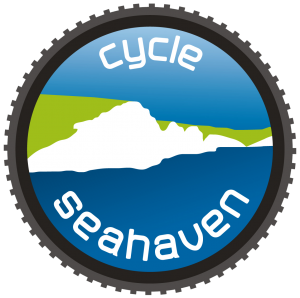 We are lucky to have a high number of Single Speed (SS) riders in Cycle Seahaven but let’s face it, we aren’t an average club. Even more impressive is the fact that all the club’s SS female riders are formidable in their own right and they never cease to impress. 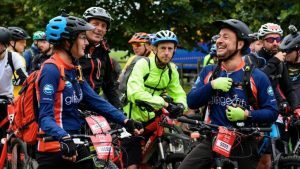 Nationally, it was inevitable with the increasing popularity of SS that someone would hit upon the idea of a dedicated SS (MTB) event. In 2014 the concept became a reality and SS UK was born. This year the event was hosted on the Isle of Wight. 120 people registered from all around the UK with a couple of foreign visitors thrown in. 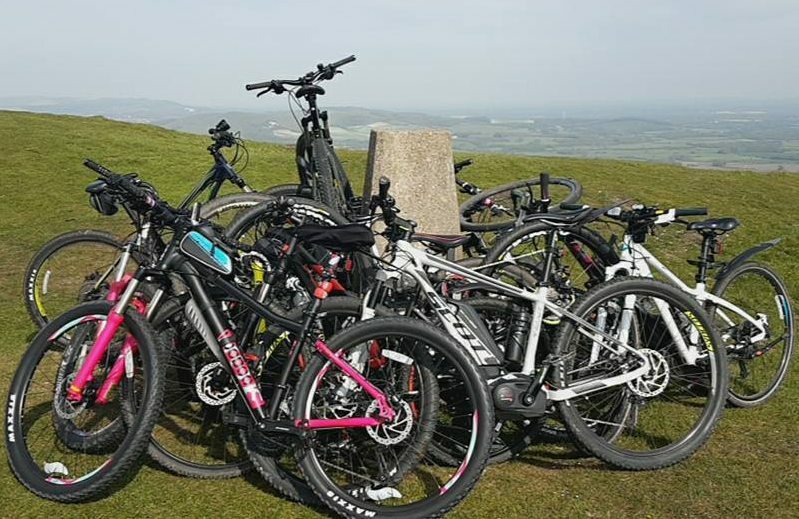 The Cycle Seahaven contingent consisted of Lexi, Ellie, Gus, Chris ‘Girder’ and I. All of us were SS UK ‘virgins’ and we weren’t really sure what to expect. The ‘SS UK 2018’ signs that had been dotted around the Island signposted the event’s location and it left me wondering how many of the locals thought there was some kind of neo-Nazi gathering occurring on their doorstep. Fortunately, there were no protesters and by Friday afternoon the participants started to gather in anticipation of the first event which surprisingly involved a pub. The ride started at 7:30 PM and was billed as a ‘moderate level’ 14-mile cross-country ride. The 3 ride leaders had been told to expect 10 to 15 riders but were faced with just over 60 instead. I’d love to see the faces of the CSH ride leaders if that ever happens on a CSH pub ride! 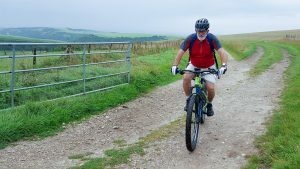 The SS ride started on a series of bridleways and quiet roads of the kind you might experience on a Cycle Seahaven pub ride, but that is where any similarity ended. It soon became clear that this pub was situated somewhere in the outer hemisphere. Two seriously big climbs that would have made Itford and Windover feel inadequate stood between us and beer. In the SS world, there’s no shame in pushing up hills, unless other single speed riders ride it, in which case you can expect to be ridiculed. On this ride, no one was going to be ridiculed as these hills would have been challenging on a pimped up E-bike on steroids. 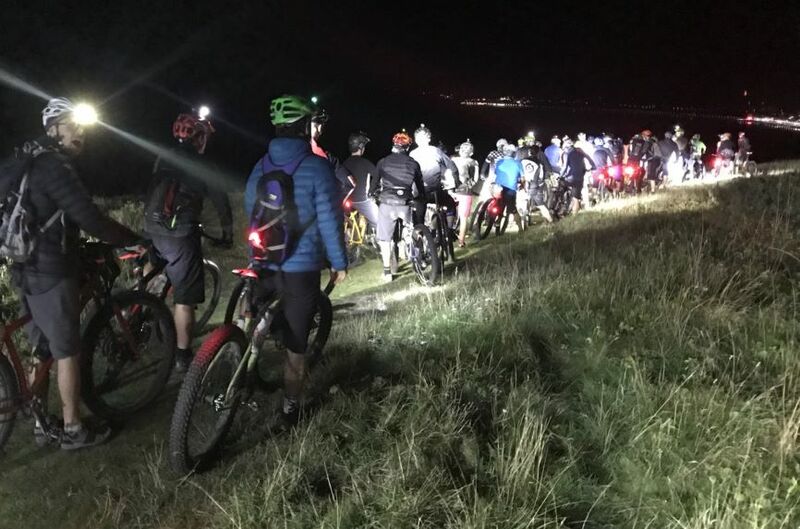 Having made it up the last hill the riders were rewarded with spectacular nocturnal views of the island, shipping lanes and the lights of Portsmouth reflecting in the Solent. The temptation to stand and stare was tapered by the realisation that 60 riders make for a very long queue at the bar. Well played Mr ‘Girder’, beer AND chips for his teamies! Fast forward an hour and the ride leaders had managed to reassemble everyone on the top of the cliffs ready for the ride down to the nearest town (Sandown). The ensuing descent could have caused a Health and Safety Officer to melt down. After all, what could go wrong with 60 beer-fuelled riders descending cliff paths in the darkness? What you can’t see, can’t hurt you; right? I am not sure why, but I thought of Lemmings midway down. Surprisingly, we all survived (maybe I was just being a wimp in the darkness) and we rode along the long sandy beach to join the promenade (and a few bemused Policemen), before a more conventional return to base. Ever concerned about the risks of dehydration our thoughtful organisers ensured there were multiple kegs of local beer at £2.50 a pint. Great value, even with the IOW exchange rate. Over a beer, I asked my CSH companions what grading they would have given the ride. ‘Z 10’ was the reply; enough said! The following morning an even larger group set out on a 16-mile route that took us along one of the many disused railway tracks built by the Victorians, who were forward thinking enough to consider their potential use for future single speed events. Many of the riders had chosen to wear fancy dress just to make the ride a little more challenging (and for those wearing thongs, just a tad disturbing). Several miles later and just over a 100 SS riders moved over to the edge of the track to let a couple of horse riders go by. They were clearly impressed but after their 65th ‘Thank you’ their voices were getting a little hoarse (geddit?….Sorry). Next came the anticipated, inevitable, hill climb for beer; the SS rider’s equivalent of a Donkey’s carrot. Whilst not as severe as the night before this was another one of those ‘get off and walk’ type hills that the organisers seemed to enjoy….sadists! 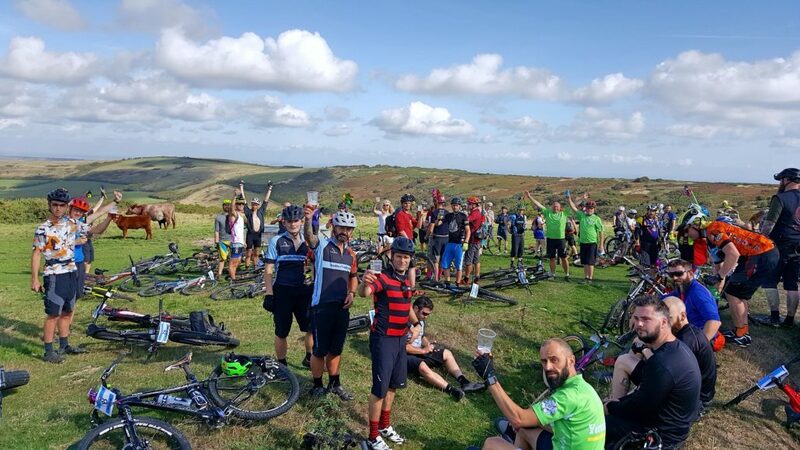 However, good to their word, several kegs of beer had been positioned at the summit and pints of beer and children’s windmills, were given to each rider. These, we were told, would differentiate the ‘hard-core’ riders from those that had elected to do the shorter ride, ‘Shirkers’ ride; who we were destined to meet further along the route. The descent this time was more reminiscent of those we regularly experience on the South Downs Way and, with the addition of daylight, there were less ‘pucker’ moments than the night before. Having joined up with the ‘shirkers’ group we all rode as one, along Sandown’s promenade towards the beach. This was to serve as the arena and racetrack for the main event. We were greeted by a local musician singing well know reggae songs in the afternoon sun, a nice touch, as we prepared for the race that would decide the SS UK 2018 champions. This year’s course involved tearing down the beach for a quarter of a mile, rounding an oil drum and tearing back up the beach, through a chicane, towards the start line. Sounds simple right, but we were soon to discover this was the bike version of wading through treacle. You will have surmised by now that anything related to SS UK wasn’t to be taken too seriously. The Championship was no exception. Our bikes were left on the beach and we were walked to the far side of a playing field immediately above, but just out of view, of the beach. This was going to be a Le Mans style start and when the horn sounded we ran, walked and stumbled for our steeds before commencing the downwind, seaward side of the course. Skidding, crashing and in some cases remaining upright, the riders rounded the oil drum at the far end of the beach before the slog into the wind along with some soft, deep sand. This was energy sapping stuff and the brief was to keep going until you quit or were told to stop. Several laps later and the organisers called a halt. Those that hadn’t reached the finish line were disqualified, those that had progressed to the next round. After a brief pit stop of beer and jellybeans, the remaining survivors went again. This process repeated itself until only 10 were left. We had our finalists. The male finalists were marched back to the field for yet another Le Mans style start; this time with a twist. 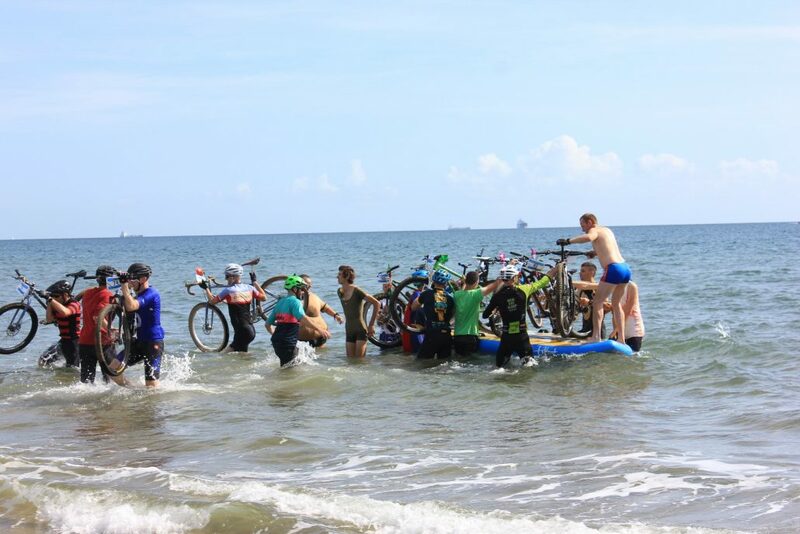 Whilst out of view their bikes were placed on a raft which was positioned about 20 feet offshore. 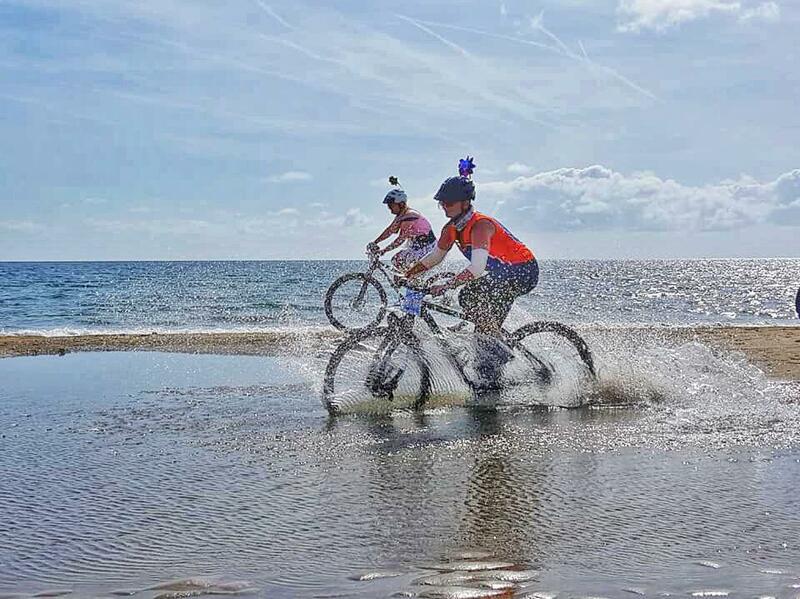 Their faces as they ran into the waist-deep water to collect their bikes was highly amusing, at least for the spectators, after which the competitors commenced another two energy-sapping laps. Finally, we had a winner! Next up was the ladies race. The six finalists (CSH SS ladies we need more of you there next year) had a more conventional start to the race. Amongst this group of athletes was our very own Ellie. Now, call me biased, but after Ellie’s serious ‘break everything I can’ crash two months ago I was amazed and impressed that she had done all of the aforementioned rides. So to see her on the start line champing at the bit filled me with a sense of pride; there’s no doubt she applies rule 5! Ellie took off like a whippet and her racing line, unlike the others, involved ploughing through a small section of the English Channel. The resulting plume of spray was visible from the far end of the beach. By the end of the race she had finished fourth; exhausted, sandy and wet. I had noted that the ‘winner’ wasn’t wearing a windmill and she was, therefore, a lot fresher than the other competitors but, as you’ve probably gathered by now, we weren’t taking this too seriously. However, for the record, I think this year’s female SS UK winner was a Scandinavian lass dressed as Goldilocks. That evening the event concluded with Fish and Chips, a live rock band, more ridiculously cheap beer, a raffle and prize-giving. To my delight Ellie had been voted by the event organisers as the most deserving female rider of the weekend, a decision cemented by her epic water splash. As a prize she was presented with a brand-new Surly Cyclo Cross frame and for once, she was speechless. How many of you can say you’ve ever witnessed that? 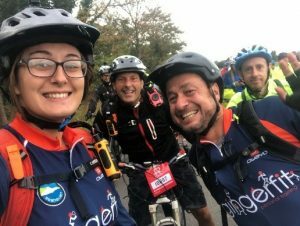 Well done Ellie, as rehabilitation rides go you smashed this weekend. This was a brilliant, relaxed and fun weekend with so many Single Speed bikes to admire I nearly dehydrated through drooling. If you’ve ever fancied having a go on a single speed please get in touch, I’d be happy to arrange something for you. You’ll either love it or hate it. It’s a Marmite thing! 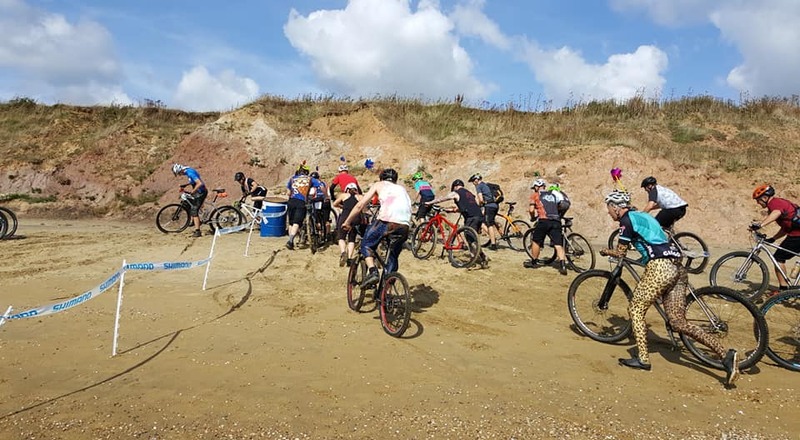 https://cycleseahaven.org.uk/wp-content/uploads/2018/09/beach.jpg 600 800 Guy Reynolds http://cycleseahaven.org.uk/wp-content/uploads/2012/04/CycleSeahaven2-300x298.png Guy Reynolds2018-09-18 07:55:392018-09-19 23:24:24It is a Marmite Thing – SS UK 2018. 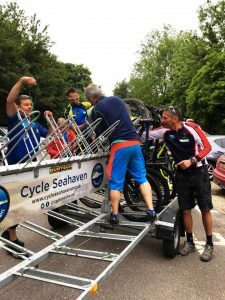 Sussex Community Development Association invited Cycle Seahaven to organise a ride for staff and work colleagues who are involved in the bike recycling project, Recycle. SCDA is a charity who support a range of community activities, helping people gain confidence in the workplace whilst learning new skills. One of these is to up-cycle donated bicycles destined for scrap, giving skill training to their operatives and making the bikes available to the public to buy. Our Ride Leader Co-ordinator, Mike Winser, organised a route with the assistance of three other Ride Leaders – Sarah Winser, Dave Sutton and Roger Lambert. On August 17th the ride started at the Centenary Park Peacehaven and the eleven riders from SCDA, who were riding bikes that had been up-cycled by themselves, cycled 9 miles via cross country, cyclepaths and road to Denton Island where SCDA were running an open day which Cycle Seahaven supported with the help of Denis Bass and Diane Norman. I wanted to say thank you and the others in your team for playing such a huge part in making the day a success. Your team was a real credit to the club. 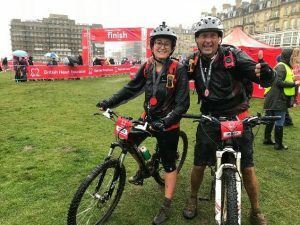 I wanted to say a special thanks to the way you supported a number of different riders, those who had bike difficulties to encouraging struggling riders to enable everyone to get to the finish point. Really grateful to those who had taken time off work to be there. Tourers and Friends Go Off Road. 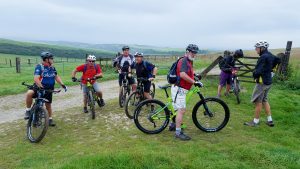 Following a chat over a cup of tea on a recent regular Touring Section ride, a few stated we would like to have an off road ride before the end of the summer, with a ride graded at 2/3C duly posted with a 9:30 start. 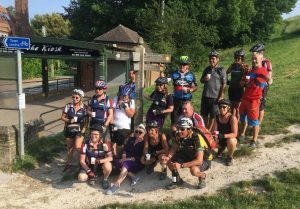 This Wednesday, five of the Touring Section Riders were joined at the White Lion by three club MTB riders who had managed to slope work or free the busy retirement diaries for the ride. Bikes ranged from 3 of the latest MTB Ebikes, to an old school cool Peugeot Rigid, with all points in between. Following the usual introductions, the safety brief was given (don’t fall off as I don’t want to do any paperwork) we headed off. 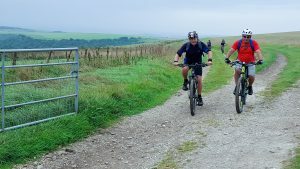 As we went up the concrete road towards the Downs, the regular touring riders noted that this section was smother than the NCN Route 2 concrete road through Peacehaven! Up towards the mist shrouded downs we went, with regular stops to admire the view/regroup, before we knew it we were at Firle Beacon, here in the absence of usual touring guru Clive, I informed the group that as this was the highest point on today’s ride it must all be downhill from here, judging by the groans from the group I could tell this was not met with glee. 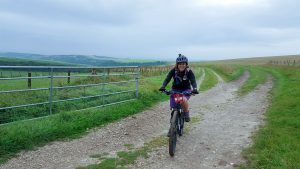 With Sue Parker racing on and opening as many gates as she could, we descended towards Firle Beacon Car Park and on towards Beddingham Towers. 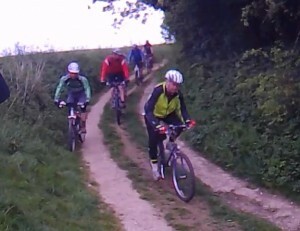 Coming up, was the only technical part of the ride, wet chalk descent of Itford Hill. I advised all of the line suggested by Team Winser, Michelle Brett advised us roadies of a suitable distance between riders, this was not for stopping distance but sheep pooh clearance, and sound advice it was too! After crossing the A26 over the bridge, Michelle demonstrated the ancient Sussex craft of sheep pooh removal using available flora! I was somewhat perplexed at C7 crossing, not at all safe! 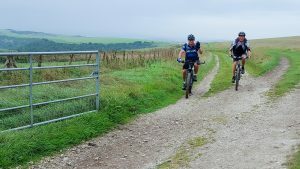 But after a little climb we were at the back end of Peacehaven, heading towards the Big Park for Coffee and Cake, well it was a Touring Section hosted ride after all. 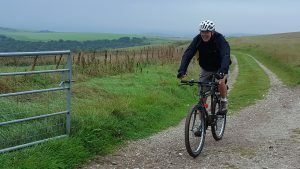 Duly refreshed, following a democratic vote we headed off and rode the cliff top path back to Newhaven then the usual route back to Seaford. In conclusion, all in all it was a great morning out, it was refreshing to ride with a mix of Roadies and MTB’ers, all getting along and having fun, not worrying about pace. We will be doing a repeat performance next month, watch out further details will be on the Calendar. 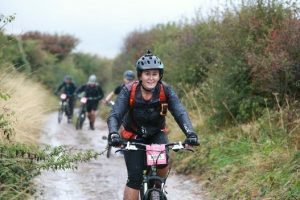 https://cycleseahaven.org.uk/wp-content/uploads/2018/09/20180905_untitled_00.jpg 1125 2000 Michelle Brett http://cycleseahaven.org.uk/wp-content/uploads/2012/04/CycleSeahaven2-300x298.png Michelle Brett2018-09-05 22:03:032018-09-06 20:10:13Tourers and Friends Go Off Road. 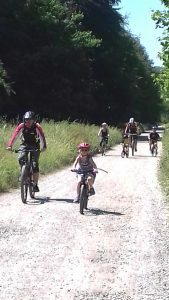 On Saturday 30th June twelve riders took to the forest as part of our monthly Forest Family Ride. As it was a smaller group this month we were able to stop at the Pump Track where the kids (both big and small) enjoyed honing their skills around the berms. 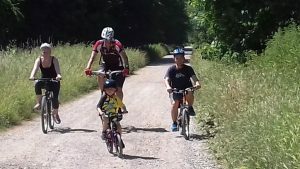 This month we were joined by a local Seaford family who had only earlier that week googled local clubs as their 8-year old was getting more and more into cycling and they wanted to know if there were any local clubs they could join as a family. Fortuitously, they spotted the upcoming family ride this weekend so came along and are now planning on joining the club. As Dad, Dixon is a roadie, he even decided to join us on his eight-year old son’s second bike giving us a couple of great photo opportunities. I sense the N+1 principle is soon to be evoked! Juliette commented on how, though she is glad they came along, she fears they will now be spending the rest of the summer with a very keen and enthusiastic eight-year old wanting to do this all the time now as he pretty much headed the ride and TOTALLY enjoyed showing everyone the Snow Run and Final Descent. I’m very happy to report another young local lad has been introduced to the wealth of free fun available on our doorstep by simply bringing your bike down to the forest. It was very hot and the shade of the forest provided some much welcome relief from the sun. Roger Lambert was our nominated driver of the Lions Club Mini Bus which took 12 cyclists together with the trailer. We also managed to rope in a friend Damien Watts to drive another 4 cyclists to our start point in Winchester. Arriving in Winchester at 8.30am we finally found a suitable place to unload and get ready for the start of a great adventure. Waving goodbye to Roger and Damien we cycled up to the start point of the South Downs Way. Our target on day 1 was Winchester to Harting Down through the rolling Hampshire Countryside. Approximately 30 miles and 3000 feet of climbing. The start of the ride saw us battling stinging nettles and brambles for a short distance however after this we enjoyed beautiful views and undulating terrain. Buster Hill was probably our biggest climb of the day however it was certainly rewarded with the most amazing decent enjoyed by all. Our first nights accommodation was at The White Hart in South Harting. A beautiful pub where we were made to feel so welcome. The staff were so friendly, food was delicious and the rooms were stunning we really did have a great evening here. Saturday morning saw us start the day with a 1 mile nasty climb taking us back up to the South Downs Way. Super tough after a lovely cooked breakfast. A few of us were tired today and struggled to get going but our lovely group rallied round and gave support. Before long we were up on top and rolling over the undulating terrain of the SDW. Sunday morning brought a tasty cooked breakfast, sore muscles and some very tired riders but today we were on our own playground. We knew what was ahead – the 4 big climbs but also with them the descents and of course the finish line. Sadly we had to say goodbye to Hilary who had been an inspiration to us all over the past 2 days but after a nasty fall and badly bruised ribs had no option to pull out. Lots of tears were shed by all and we have all promised to ride the last day again once Hilary is fully recovered. Joined today by Alien and Gus who helped with gates and encouragement also helped the ride go smoother. 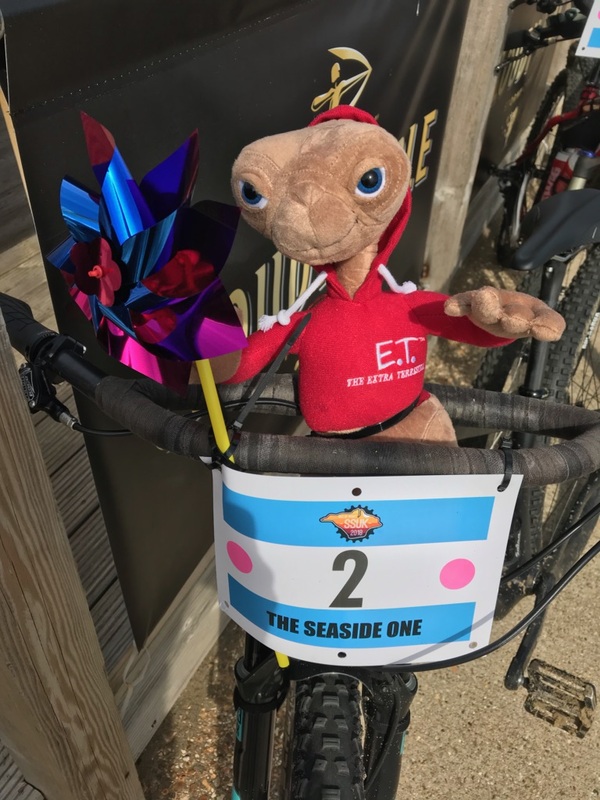 At the top of Eastbourne we hit the Elliedrome and we believe broke the record for the most number of riders at one time. The descent was amazing and such an achievement by all. This ride has been so much more wonderful thanks to the group working so well together and supporting each other throughout the journey. We are all so lucky to be part of such an amazing club and to have such a wonderful family supporting us all. Some of you will have noticed that there is a new ride featuring on the calendar this Sunday, the ride entitled “Funday Ride” which will be led by Roy Francomb. The new ride is aimed to run at a level just below our Sunday Improvers ride. The Improvers group has progressed and raised the bar as to the mileage and terrain we cover, leaving a gap for a slightly lower grade ride on a Sunday. Roy has kindly offered to run the “Funday” ride. 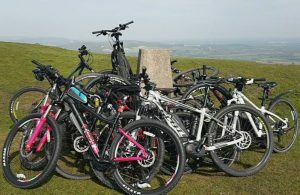 This ride will be for those who want a slightly less challenging MTB with a coffee and cake stop on a Sunday. 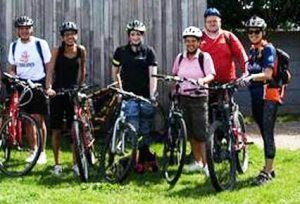 Where & when possible we will try to arrange for the Funday & Improvers ride to meet up for Coffee & Cake at some point on the ride or at the end of the ride. 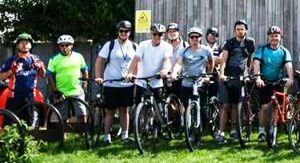 So if you fancy getting out on a Funday ride you can contact Roy via our ride leaders contact page. The weather wasn’t especially clement – chilly and breezy on the top but then warmer under the shelter of the trees – but at least we missed the rain. Once again it looked like there were plenty of PBs including the road ride to our left turn at the (former?) YHA hostel, before we dropped down to the footbridge and along the Litlington road back to our re-grouping point at the pub. In Litlington we met, briefly, the 4D and Helen’s Birthday Ride groups, looking purposeful, on a day when there were a further 3 road rides. That’s a lot of rides! Couldn’t help but notice the sheep field was despatched a bit more casually and with more bunching than usual. Getting faster. So, if my Garmin would give up it’s secrets, which it won’t for some reason, I’d pass on the ride data – distance, feet climbed, average speed. I’m guessing we did about 16/17 miles, climbed over 1000 ft and averaged maybe 7 mph?? ?